It's official! Summer 2014 is finally over and with it, hopes for the arrival of a much-awaited guest that never showed up. I'm talking, of course, about the CarPlay firmware update for Pioneer NEX receivers that was supposed to arrive a few months ago. Well, there you have it. 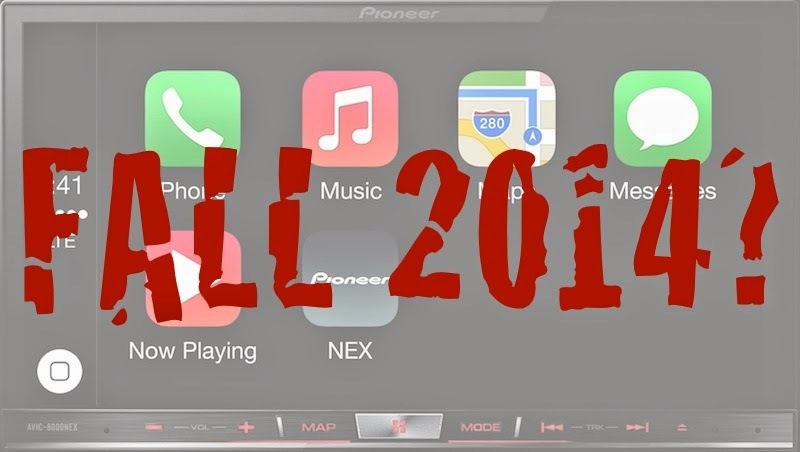 Now the ETA for CarPlay on Pioneer NEX is simply "Autumn" (or Fall, for my fellow American readers). I just hope it won't get pushed back even more. Especially when it's time for Pioneer's next generation car head units. The eagerness around CarPlay is almost palpable at this point. 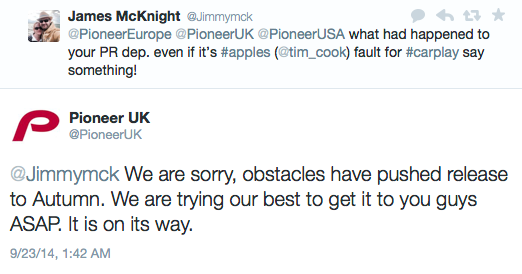 Pioneer USA needs to come out and make an official statement explaining what exactly happened. NEX customers that purchased devices hoping for CarPlay this summer, have been left waiting high and dry. Even if it is Apple's fault, someone familiar with the matter needs to say something. Pioneer's customers can only blame Pioneer for the delay. It's about time the company's PR department put itself to work. There are rumors about another Apple event sometime in October (iPad/Mac event on the 17th?). Hopefully we'll hear something by then. Thanks to Alfonso Leon for the heads up on this news. Its time for class action.... I purchased my unit based on the ADVERTISED firmware release from Pioneer. It really looks like they can not be trusted. Thought I'd share with you a response I received from Pioneer USA... Basically they tell nothing. I'm sorry, the CarPlay update is not yet available. The engineers are working to release the update as quickly as possible. Unfortunately we do not have an updated ETA. Competition is tough for the first manufacturer to release carplay! Seems like its better to claim carplay support first and not support it as opposed to claiming last and actually support it. Its all about sales peeps.